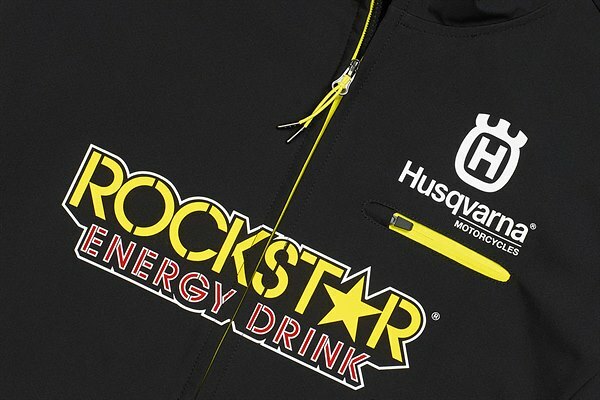 In conjunction with the release of the 2019 FC 450 ROCKSTAR EDITION, Husqvarna Motorcycles are pleased to announce the release of the new ROCKSTAR ENERGY HUSQVARNA FACTORY RACING CASUAL CLOTHING COLLECTION. Consisting of premium quality team and lifestyle garments, all items are designed to celebrate the success of the Rockstar Energy Husqvarna Factory Racing team. Honouring the long-term partnership between the two global brands, the updated line of 2019 Rockstar Energy Husqvarna Factory Racing Casual Clothing combines the logos of both Husqvarna Motorcycles and Rockstar Energy Drink to create an exclusive apparel range for dedicated race fans. This new collection features a series of race replica and lifestyle items for both men and women. This exciting clothing range is not reserved exclusively for Rockstar Energy Husqvarna Factory Racing team riders but is available to all who want to be part of the ongoing success story. Perfectly replicating the Rockstar Energy Husqvarna Factory Racing team look, the RS REPLICA SHIRT has a sporty cut, tapered breast pocket and a large logo print. Constructed of cotton, it offers high wear comfort blended with elastic materials. Offering an athletic fit, the RS REPLICA HARDSHELL JACKET is breathable, water-repellent and wind-resistant. Designed from high-grade functional materials, it also features two large external pockets. The perfect beanie for dedicated Husqvarna fans, the RS REPLICA TEAM BEANIE is made of 100% polyester and proudly carries the official logo of Rockstar Energy Husqvarna Factory Racing. Built from 100% high-quality cotton, the RS TEE BLACK features special seam detailing, high wear comfort and a crew neck collar. The unique WOMEN RS TANK TOP offers sporty style and high-comfort combined with special seam detailing. Designed with taped breast pocket, it also features two well-placed logos. Availability of individual items may vary from country to country. For further details on pricing and availability, please refer to your national Husqvarna Motorcycles subsidiary or Importer. ROCKSTAR ENERGY HUSQVARNA FACTORY RACING CASUAL CLOTHING COLLECTION will be available at authorized dealers from February 2019. This entry was posted in Global News, Lifestyle, Moto, Motorsports, Product, Products by 1_KC_148Y. Bookmark the permalink.